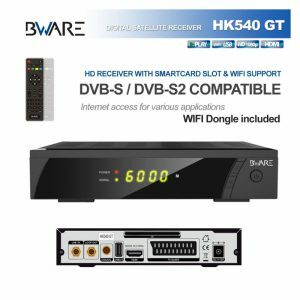 The BWare HK-540 GT is our latest high specification fully featured High Definition 1080p digital satellite receiver from established manufacturer BWare part of Digiquest Electronics. Add to any adult card order for just £69!! Save £10!! The BWare HK-540 GT is low in price, very compact in size but packed full of features including a super fast blind hardware scan function, built-in multi-CAS card reader slot which works with all the Viaccess and Irdeto adult cards we sell, massive channel memory, DiSEqC1.2 positioner (USALS), USB for software uprade, networking and PVR recording. The BWare HK-540 GT is internet ready has a Wifi USB Dongle included for access to future applications. In addition this receiver uses a seperate 12v DC Power Supply, making it ideal for caravans and boats.